Formula Editor - simplexetys Webseite! The formula editor in Simplexety is a powerful interactive equation editor for Microsoft Windows that lets you create mathematical notation for its calculations. You can simple convert it into a normal formula view, too. 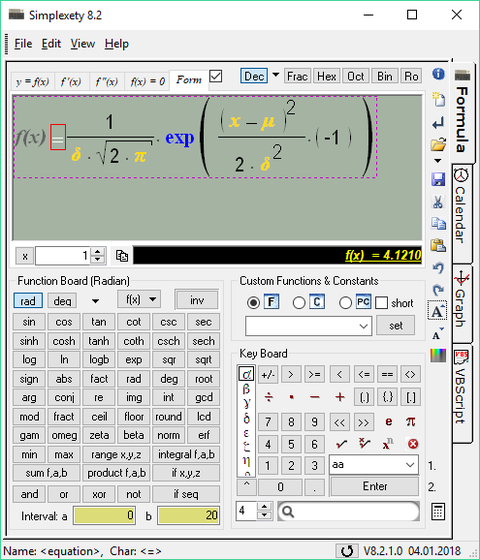 Simplexety includes a complete math equation editor along with options to edit comfortable each element live on the display. That means, Simplexety has a WYSIWYG (What-You-See-Is-What-You-Get) math editor. You can write colored or black math equation like a sophisticated pocket calculator. Select an equation symbol (like fraction bar) from the corresponding dialog button. Then you get an equation with placeholders on top and down side. By moving the mouse over the equation the nodes are highlited. Select a placeholder with a single left-mouseclick. Now you can overwrite the placeholder with any symbol or number you want. By selecting a symbol with a double-click, the whole subtree of the node is selcted (e.g select the = from an equation with a doubleclick and either the left and the right side of the equation are selected). If you select a variable-node, a constant-node, a number-node you get into the editing by another left-mouseclick.